You know, about 20 years ago when I was getting started in this sort of industry and my business, I worked with a gentleman called Nicholas Lynch out of Melbourne. Nicholas was a top-selling real estate agent in Victoria. We were doing a program together – he was teaching real estate and I was teaching mindset. And Nicholas’ story was absolutely phenomenal. He was the youngest, high-selling agent in his whole franchise. He started when he was 15. He wasn’t allowed to sell property so he started walking door to door and providing leads to other agents. And the year he became old enough to become an agent, he became one I think it was 17 or something by law, and he immediately went to the number one agent in the whole franchise chain. Or words to that effect, it was a phenomenal story. But anyway, at those events and we held one in Auckland, New Zealand, a beautiful city, and I remember Nicholas saying “Don’t be a finder of buyers of property. Be a finder of sellers of property.” And he said it so quickly and it rolled off the tongue, and I never really even thought about what that meant. What Nicholas was saying is, you know, in real estate as an agent, they’ve got two customers. The customer is the person that buys the property but the real customer for the agent is the landlord, the seller of the property. So what he was saying is don’t worry about finding the people to buy the properties; they’ll find you, they’re there. He said your goal is to find the landlords that are willing to sell. So that’s what an agent’s job is: to find the sellers of property. Now, in regards to Airbnb, ladies and gentlemen, same thing applies. Do not be a finder of people to rent on Airbnb. They’re there. The market is massive. The demand outstrips supply, it’s incredible. 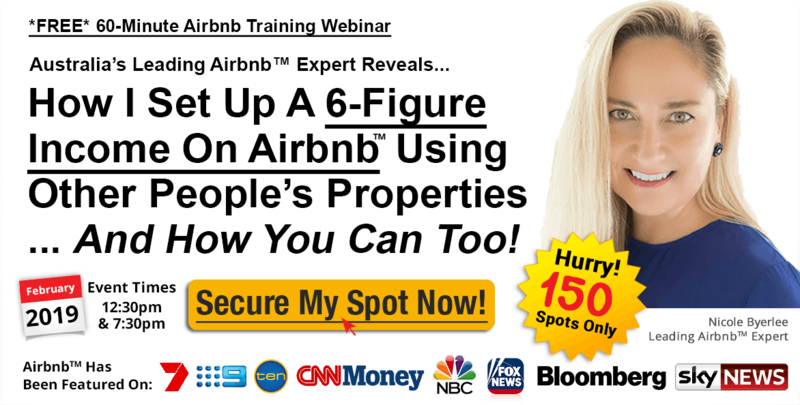 What you want to be is a finder of the gold, and that is the properties to host on Airbnb. Ladies and gentlemen, there are golden properties for Airbnb right now. Certain price range, location, features, all this sort of stuff, and some of them are way more valuable than the property next door or in the next building or the next block. That could be for many, many reasons. But the gold is in finding the properties that you could rent off the landlord legally and then release at commercial nightly rates on Airbnb. So there’s my tip for you, ladies and gentlemen. Don’t worry about finding the customers, they’re already there. What you want to do is be the finder of the golden properties that you can rent and then host on Airbnb because this is where the money is. If you want to know how to do that, obviously get in touch with us or check out something on this page somewhere, there might be a link to something. But that is the tip for now. You got to know what’s called your dollar-productive activities. You see, you and I get really busy doing stuff everyday answering phones, doing mail, checking this, checking that, doing reports. None of that makes money. There’s only a couple of things in a business that makes money and we call them dollar-productive activities. Spend 80 percent of your time on that, and you’ll likely be a very, very wealthy person. When it comes to Airbnb, my tip to you is: find the golden hostable Airbnb properties. Now, stop watching me and get on it. Cheers for now. Catch you next time. Bye-bye!